Junior Malili Muliaina, widely known as Mils Muliana, is a dynamic and dependable fullback who has played a key role in New Zealand's recent dominance of the international stage and built a reputation as arguably the best No.15 in the game. Blessed with pace, great awareness and a highly-prized ability to spark a counter-attack, he has provided successive All Blacks coaches with a valuable weapon who is equally able to cover wing and centre at the very highest level. Born in Salesi, Western Samoa, Muliaina moved with his family to Invercargill at the age of 2 and after impressing at age-grade rugby he was offered a scholarship to Kelston Boys' High School in Auckland. Further recognition of his ability would come with the NZ Secondary Schools XV and Under 19 sides, and in 2000 and 2001 he was part of the New Zealand Under 21 sides that claimed the world championship titles. Muliaina has also been capped by the New Zealand 7s side and was part of the side that won the Commonwealth Games gold medal in Manchester in 2002. His All Blacks debut followed in 2003 when he appeared as a replacement in the 15-13 defeat to England at the Westpac Stadium in Wellington. He featured in New Zealand's Tri-Nations success the same year and was subsequently included in the New Zealand squad for the 2003 Rugby World Cup in Australia where he would finish joint top try-scorer alongside team mate Doug Howlett with both players registering 7 tries in 7 appearances. The following year he was the only player to be selected for every one of the All Blacks 12 Test outings. He featured in all three Test victories against the British & Irish Lions in 2005, a year that also saw more Tri-Nations success and a grand slam tour of the UK & Ireland. He retained his place in the squad throughout 2006 and 2007 and appeared at his second Rugby World Cup in France where the All Blacks again made an earlier-than-expected exit. New Zealand's Tri-Nations dominance continued in 2008 with Muliaina an integral part of the side and he also featured in three Tests on their grand slam tour of the UK & Ireland later the same year. With regular captain Richie McCaw sidelined by a knee injury, Muliaina was named as All Blacks captain for the opening Tests of the 2009 international season and went on to rack up another 14 appearance in another stand-out year. 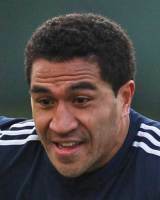 Muliaina joined the Auckland Blues Super 12 team in 2001 and was a part of the side that claimed the Super 12 title in 2003. He currently plays for the Waikato in the New Zealand provincial competition and the Chiefs in the Super 14 and helped the latter to the final of the Super 14 in 2009. A broken thumb and then a calf strain reduced his 2010 Super 14 season to four matches but he battled back to fitness to reclaim his place in the All Blacks side later in the year. Muliaina put his injury worries behind him during the 2011 Super Rugby season and impressed for the Chiefs. He will journey to Japan following the World Cup but he will looked set to go into the tournament as the All Blacks' first choice fifteen having featured prominently throughout the Tri-Nations. However, a resurgent Israel Dagg threatened Muliaina's place in the side with coach Graham Henry seemingly favouring the Crusaders back over the Chiefs man. However, Muliaina earned his 99th cap against Canada in the Kiwis' final pool stage match and then against Argentina he became only the second All Black to reach 100 caps. However bitter disappointment followed as he was ruled out of the remainder of the tournament with a shoulder injury, bringing to an end his international career.